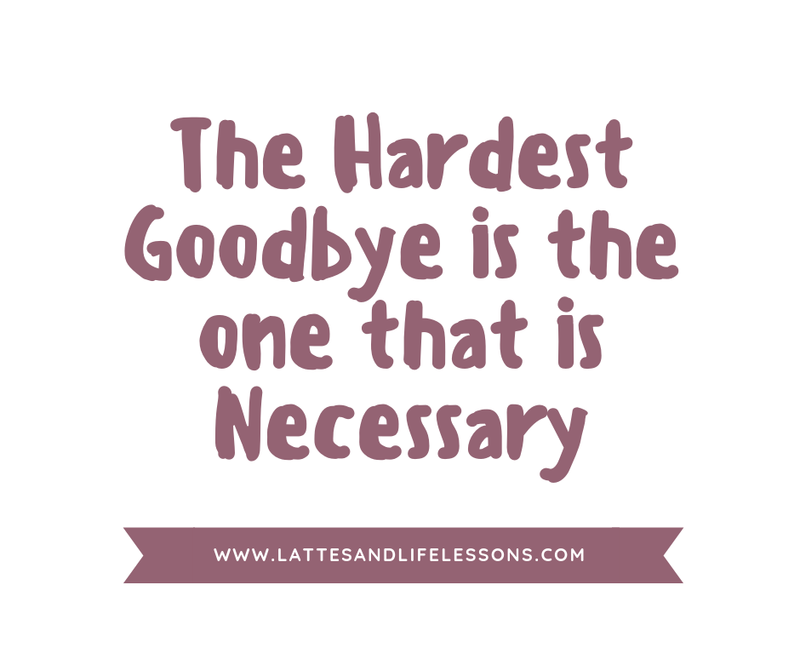 How do you know when it’s time to say goodbye? 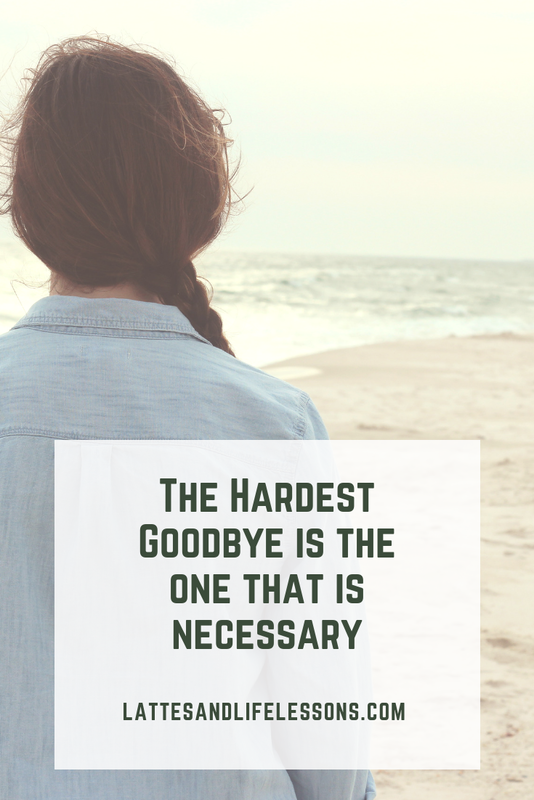 More importantly, how do you know when it’s time to say goodbye to someone dear to your heart? How does one even do that - say goodbye to someone you care about so, so much? It has to be impossible, it just can’t be done. Right? That’s what I thought too until the day finally came. I finally reached a point where I was tired of being lied to, used, and manipulated by someone I was very close to. I constantly made excuses for her, lied for her, ran to her side whenever she snapped her fingers, it took me so long to realize that I was enabling her. Me doing these things for her were only telling her that she didn’t have to change - that her actions were okay - because she will always be forgiven and always have someone to fall back on (me). I was in no way helping her grow as a person, and when I finally realized my own mistakes, she wanted nothing to do with my help and didn’t want to hear what I had to say. To be treated like dirt whenever I didn’t drop what I was doing to run to her as soon as she snapped her fingers, to have her throw a temper tantrum whenever I didn’t give her what she wanted… She uses everyone that she can, and makes empty promises and false apologies… It‘s all just too much and I couldn't handle being treated like that any longer, no matter how close we were or how much I cared for her, ten plus years is far too long. 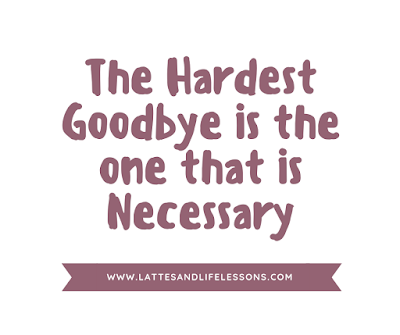 The hardest goodbye will always be the goodbye you have to say to someone you never thought you’d have to live without. But you know what? Those goodbyes are the ones that are necessary. Necessary for growth and change; sometimes people need to grow apart to become who they are meant to be, and sometimes people need to accept the fact that they need to go their separate ways in order to be rid of the toxicity in their lives (even if your favourite cousin, sister, aunt, or best friend is the source of that toxicity). You need to know when it is time to say goodbye. Furthermore - for the betterment of your conscience - you must understand why it had to happen. The sooner you accept that this is the end of your story together, and learn to let go, the less difficult and uncomfortable the healing process will be for you. Pain is inevitable, of course, you will feel a lot of it during the goodbye, but it's alright. It hurts this much because you have loved this person, and it will hurt for a while, but not forever; soon, you will realize how much your life would have improved, how peaceful your mind will be - I have. So trust me when I say, saying goodbye will be the best thing for you, and no! It is not selfish, please don't let others tell you otherwise. No one can make you happy except for YOU. Focus on yourself now, there’s nothing wrong with choosing yourself, especially after you have been putting others first for so long. You may hear people say this all the time, but that's because it's true. Until you are one hundred percent happy with you, you will never be happy with anyone else. This is such an important lesson to understand. You will never be happy with someone else unless you find happiness with who you are and the life you lead FIRST. Too many people are in relationships depending on each other for happiness. It doesn’t matter what kind of relationship that is - romantic, friendship, family... They end up miserable because they constantly depend on another person to make them happy, instead of finding happiness within themselves first. Learn how to be happy by yourself, take yourself out on dates, celebrate by yourself once in a while, go for walks on your own; I promise you, you will see such an amazing difference. Have you ever experienced a horrible feeling that you couldn't explain or even understand, but the feeling of wanting to do something about it was overwhelming? I've been there. It drove me crazy for half a week because I knew that something was off. I just didn’t know what that was. It wasn’t until a night of family celebration that I finally understood the horrible feeling I had. It was a Facebook message on my partner's phone. I don't know why did it, and I don't know how I knew that the answers I craved were on his device, but as soon as I knew that he was in a deep sleep, I turned on his cell phone and scrolled through his messages until I saw something that felt off to me. As soon as I started reading, my stomach twisted and the oxygen of the room vanished. I glanced up from the phone screen to look at him as he slept, tears streaming down my face. I just couldn't understand, or accept, why he would even do such a thing. To think, not a few weeks before this, he told me he loved me for the first time and were planning on moving in together. My world collapsed at that moment. This was my "discovery day," as they call it, and it is as awful as you would imagine. To this day the events are still fresh and still raw. I know the memories should not be messed with, especially if I want to fully move on, but I still think of it time to time; I can't help it, and it's not like I do it intentionally. The horrible memory always seems to manage to sneak its way in. It is a day that will forever be etched on my heart, mind, and soul, of that I can be certain because I was forced to go through the feelings of betrayal, heartache, and humiliation, and was left to live in a constant state of what feels like an emotional hangover. 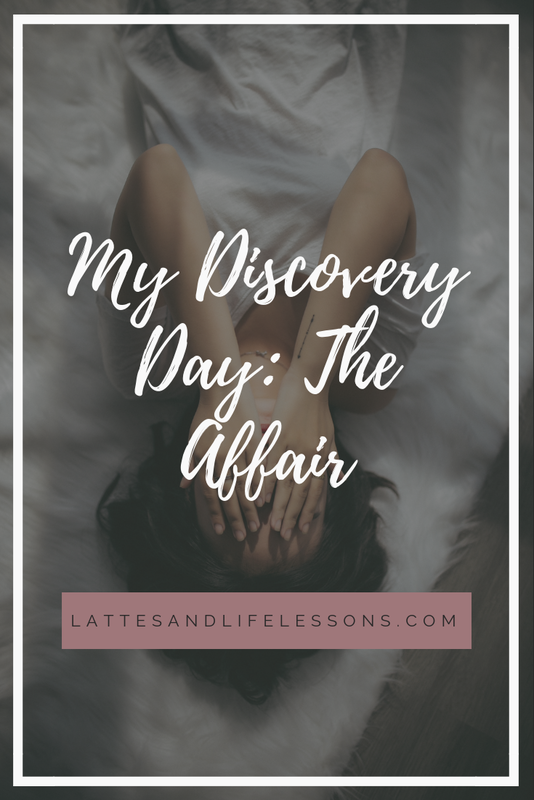 I'll be honest, it is hard to find your footing in the weeks - and even months - following the discovery day, and hell, it was hard to get out of bed to even put my feet on the ground. 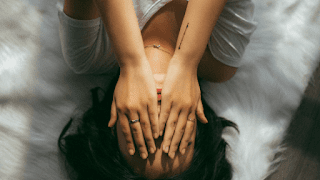 But even early on, one thing seemed to ease the heaviness of processing my horrible reality; I had to share my story, even if it was just with family and closest friends so that I didn’t feel alone in my sadness and anger. I couldn’t have handled it alone, it was too much, and I definitely wasn't ready to have a sit down with my partner. Sharing the experience of the affair has helped a lot; I wasn't bottling anything in which would have potentially harmed my mental health and wellbeing (you should never bottle in your feelings and emotions). Family, friends, and support groups offer a listening ear, a shoulder to lean on, and great comfort. There are days where I still feel hurt and emotionally hungover, but I am committed and confident that I will leave all of this heartache behind me and in the past where it belongs, and I’ll eventually get back upright after one of life’s obstacles. After talking things out and receiving advice from the people closest to me, my partner and I decided to work things out and rebuild the trust and love that was shattered. It's been three years since the affair, and although we worked it out and we are now closer than we have ever been, things are not easy. This does not bother me anymore because I have realized that no great relationship is ever easy or perfect; there's just no such thing! I know a lot of people would not have stayed after going through something similar - and believe me, I almost didn't! - but after thinking things through, I wanted to give our relationship a second chance because anyone can make mistakes, and the potential that I saw in us was something I was not ready to let go of. It is up to you, and only you, whether you should stay or not. If you cannot forgive and let go, then my advice would be to leave. If you stay, knowing that this experience will always haunt you and something that you may use in arguments against your partner, then the relationship will not be healthy for either of you. If you want to stay, then you need to learn how to let go, forgive, and move on (after talking things over). This process takes time, but it is crucial for the health of your relationship that you are sure you have let that experience go to focus on rebuilding a strong relationship with that person again. And if you have gone through something similar, I am so sorry that you did. That pain and betrayal is something no one should ever have to experience. My best wishes to you! Synopsis on Goodreads: Five hundred miles north of Vancouver is Kitamaat, an Indian reservation in the homeland of the Haisla people. Growing up a tough, wild tomboy, swimming, fighting, and fishing in a remote village where the land slips into the green ocean on the edge of the world, Lisamarie has always been different. Visited by ghosts and shapeshifters, tormented by premonitions, she can't escape the sense that something terrible is waiting for her. She recounts her enchanted yet scarred life as she journeys in her speedboat up the frigid waters of the Douglas Channel. She is searching for her brother, dead by drowning, and in her own way running as fast as she can toward danger. Circling her brother's tragic death are the remarkable characters that make up her family: Lisamarie's parents, struggling to join their Haisla heritage with Western ways; Uncle Mick, a Native rights activist and devoted Elvis fan; and the headstrong Ma-ma-oo (Haisla for "grandmother"), a guardian of tradition. "Six crows sit in our greengage tree. Half-awake, I hear them speak to me in Haisla. La'es, they say, La'es, la'es." 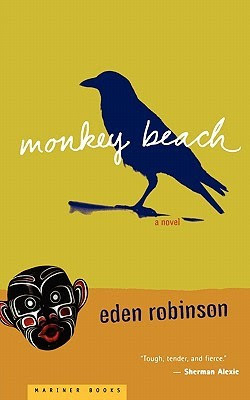 Author Eden Robinson combines mystery, thrill, and the supernatural in this brilliant, and amazing novel Monkey Beach. 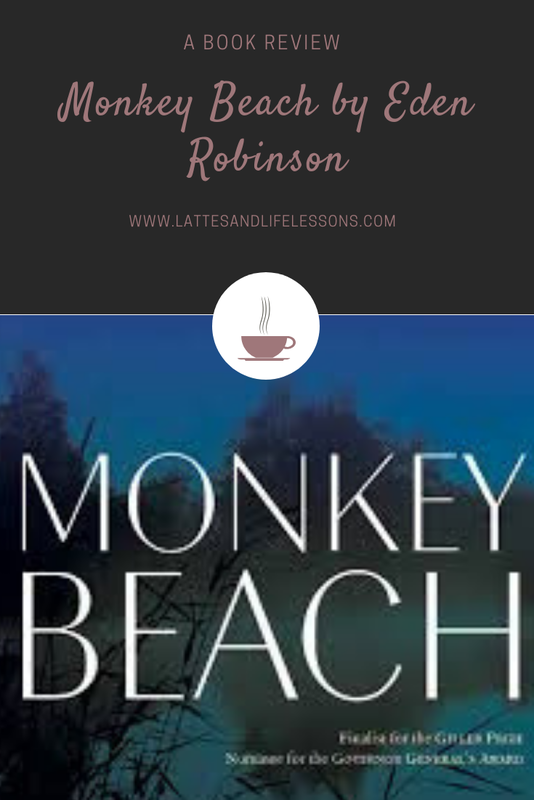 Robinson delves into the story with Lisa’s brother, Jimmy, lost at sea; which, understandably, has her family in distress and sombre; we see Lisa and her father smoking constantly as her mother tries to keep herself busy. The story is set in Kitamaat Village, BC, Canada, and Lisa is about nineteen years old (this information is slightly given as she stares at the Elvis clock her brother had gotten her for her birthday the year before) when her and her family get the call about her brother lost at sea. From the beginning, it seems as though Lisa may be addressing a reader that is not Haisla, possibly someone who isn't even First Nations; from the first page (and continued throughout the novel), she gives directions as to where precisely Kitamaat Village is, something a local would not have to do unless speaking to someone not from around those parts; she also tends to explain the Hailsa words and phrases being used in the novel (i.e. the B’gwus means Sasquatch), something she would not have done if she were speaking to someone who was Haisla, or even native. Thus, I am certain she is addressing a reader who is not native, or a person who is simply not a local. The novel for me was slow moving at first. But after getting through the first two chapters, this changed almost instantaneously. I loved how Robinson took the time to allow readers to explore Lisa’s troubled past, which had shaped her into the woman she had become. The tangle between the spirit world and present world was amazingly written, and a very interesting touch. For a person like me who has never heard of this novel, that was something I was not expecting, but I can’t help but wish there was more written about the spirits, as it seemed to be a very important part of who Lisa was, and who she became. My least favourite part of the story would have to be the ending, as it left me with questions that I probably will never have the answers to: was Robinson depicting both the B’gwus and the “sound of a speed boat” as being spiritual? And, did Lisa end up surviving? Although I am frustrated that these questions weren’t answered, I think the ending was ambiguous and was fitting for a novel that left you with a lot of mystery to begin with. All in all, I enjoyed this novel tremendously, and will definitely be reading it again in the future. "Close, very close, a b'gwus howls - not quite human, not quite wolf, but something in between. The howl echoes off the mountains. In the distance, I hear the sound of a speedboat." Eden Victoria Lena Robinson (born 19 January 1968) is a Canadian novelist and short story writer. 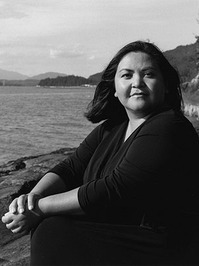 Born in Kitamaat, British Columbia, she is a member of the Haisla and Heiltsuk First Nations. She was educated at the University of Victoria and the University of British Columbia. So, I'm a stepmom. I'm not sure what that means to you - I can' t read minds - but to me, it means the world. I became a stepmother (or “bonus mom”) at a very young age; I had just turned nineteen, to be exact. It’s been several years since then, but I can still remember the first time I laid eyes on the handsome little boy I now call son, as if it were yesterday. His hair was lighter, longer; his face, arms and legs chunkier, and he was so tiny. I remember how he would burst into our bedroom early in the mornings, throw his bottle at his father's face (yes, literally) and demand it to be filled, I've never laughed so hard as I watched it happen for the first time, I was both shocked and amused. I cannot tell you enough how this life that I am living now, is not the life that I had planned or wanted, but I am beyond grateful and glad that this is the life I do, in fact, get to live and experience. 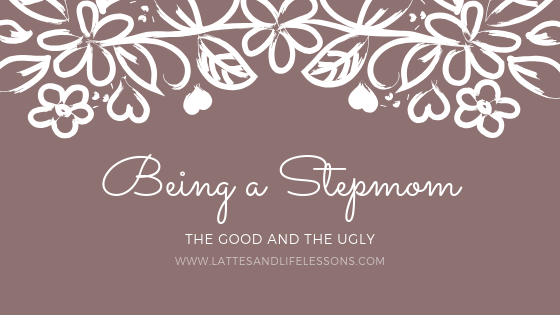 Since becoming a stepmother, I seen parts of myself that I am not exactly proud of; in fact, I am rather disappointed and disheartened by who I was just a mere two and a half years ago. Since then - fortunately - I have seen myself grow into the woman and (bonus)mom I am now today; someone, I am sure, who is still far from being perfect, but someone I am now proud of. I have a home, an amazing little boy, a supportive and caring partner, and wonderful furbabies; I’m in school, I’m very close to getting into this welding course I have my eye on, and I am only a year or two away from finally graduating high-school! I may be almost seven years late, but better late than never… right? After obtaining my Adult Dogwood ( fancy name for an adult high-school diploma in British Columbia), I am going to be working towards several things; Social Work, being one, and interior design, being two, I’m not sure what the third thing is, just yet, but it’ll come to me. Now, I would be lying if I said life as a bonus-mamma was always great and easy - it is far from, believe me (if you’re a bonus mamma too, then you probably don’t need the context - you know!). Not even two months into my relationship with a single father, I knew the role I would be taking on as his child’s stepmother would be unnecessary difficult and stressful. Dealing with a high-conflict Bio-Mom (who will only be known as “BioMom”) is one of the most stressful things imaginable, things started off great and amazing - we all got along - but then out of nowhere her true colours came out to play and things have been a little hellish since: childish arguments, pettiness, slander, vindictiveness, and lies, to shed light on only some of the things we have had to deal with - and still do. You have no idea how often I thought of calling it quits and leaving, just because I didn't want to deal with the stress anymore, but I couldn’t - because I would like to think that my love for these two (Charles and Charlie - my partner and stepson) are much, much stronger than the challenges thrown our way. I would love for she and I to be able to work together and get along, not only for our son, but for our sake as well, and god knows I’ve tried - multiple times - but it's clear that won’t ever happen. I’m in no way saying that only she is always the only one in the wrong either, no! I know full well that my partner and I have done things that we’re not proud of - the difference being, we strive to correct our errors and we try to learn from that lesson as best we could so that we don’t make such mistakes in the future, not blame others and pretend to be the victim of every bad situation we create for ourselves. After reading all of the above, you are probably wondering why I don't just leave, instead of staying in a situation that is obviously more difficult and stressful than it has to be, the answer is simple. Charles and Charlie are my family. Charles is my partner and Charlie is my (step)son. I didn't want this life, but somehow, this life chose me, and it turns out this is the life I have needed. Things are only difficult when it's time to interact with BioMom, when she is on a power-trip (when she's not, she's actually pretty decent); other than that, my family has nothing to do with her and things are normal and great - this will probably confuse you, so allow me to explain as best as I can before my inbox becomes flooded with judgement and angry moms. Charlie is HER son, I know that, Charles knows that, and Charlie knows that. BUT, this family is not hers. She has parental rights and she gets him every weekend and holiday, and she has a say when it comes to Charlie (naturally, she's his mother), but other than that, our family does not concern anyone aside from the three of us only. Charlie's relationship with me and BioMom are completely different, he knows who his mother is; but I've been raising, loving, and caring for him as my own, for almost five years, so, yes, my relationship with him is motherly. I stay because although I did not give birth to him, he is my son, and mothers - no matter what kind of mother you are - do not abandon or give up on their family. 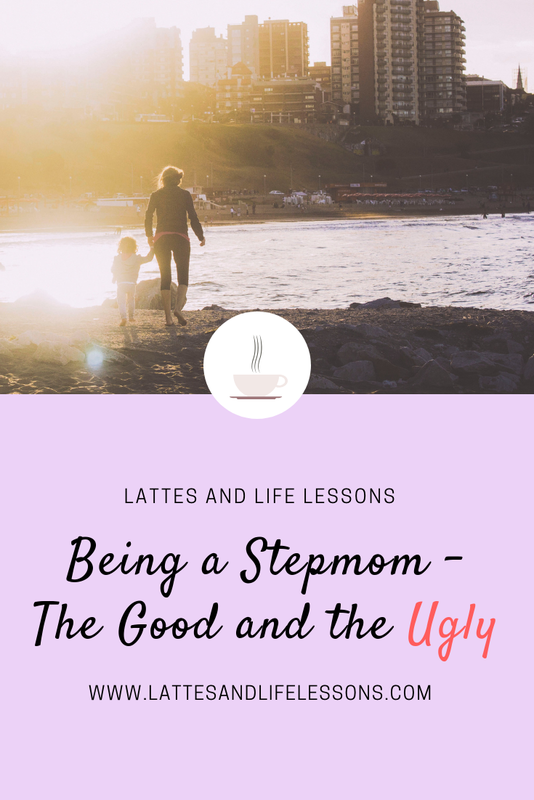 To sum it all up, there will always be pros and cons for everything, but unless you are a stepmom, you will never understand the pain and stress we go through each day. We are overlooked, mistreated, frowned upon, ignored, and it seems nothing we do is okay in the eyes of society and (most) bio-moms. Why do we continue? For our family. Because we are strong and we are amazing and we do NOT have to apologize for loving our family the way that we do. If you’re a bonus mamma dealing with a HCBM (or just want to chat with a fellow stepmom) please do not hesitate to reach out! I’m always looking to support my fellow stepmoms, and looking for support, myself. Until then, I hope everyone has a great day! A writer, aspiring author, children's advocate, reader, and a part-time student. She loves to empower and inspire others, and is "mom" to her stepson, Charlie Jr; to her Husky/Pyrenees cross, Missy; and to her orange tabby-cat, Lucas. She is also a caffeine, candle, and office supplies addict and a die-hard Harry Potter fan.